Great band from Sant Cugat del Vallès (Barcelona9, with excellent vocal harmonies and an amazing sound. Their musical and artistic proposal is to perform The Beatles in a classical and respectful way, living music inside-out, and highlighting the vocals (as the band members come from the lyric world). They claim The Beatles, after 50 years, have already become classical music. 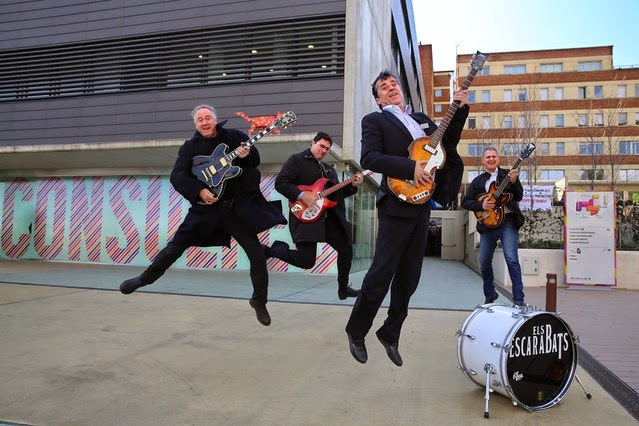 Consequently, Els Escarabats have started the project of remembering, during this decade, in a consecutive and chronological way, the 50 years of each event, concert, recording or trip made by the Fab Four, musically evolving as they did. By now, they have recorded 6 LPs on the 50th anniversary of each one of them. That is, chronologically, PLEASE PLEASE ME and WITH THE BEATLES (2013), A HARD DAY’S NIGHT and BEATLES FOR SALE (2014), HELP and RUBBER SOUL (2015). Of course, they are preparing REVOLVER for this year 2016.